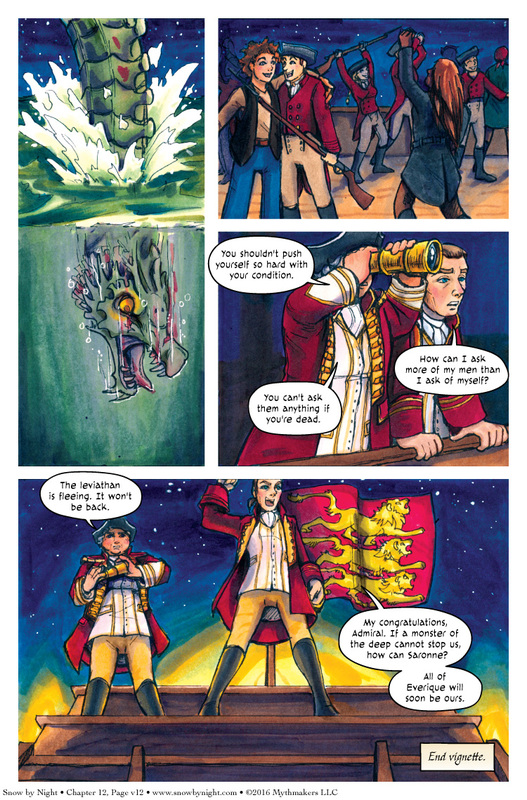 The leviathan flees to the delight of the Morantine on Page 12 of Serpents in the Water. The fleet is safe but Aradie stands in the crosshairs. This wraps up Serpents in the Water by Cindy Mirabile. Thanks for drawing for me, Cindy! I think it’s time for us to go see what’s going on with the Blaise, Snow-by-Night, and the Liranequois. We’ve been away from them far too long. I’ve missed them! Especially Tooth Kit. She’s a hoot. You can see what she’s up to when you vote for Snow by Night on Top Web Comics! We’re back to Chapter 13 on Monday! I was at Balticon last weekend. It was a great con. A little chaotic, but a ton of fun. I got to meet a lot of great people. Since they’re all literary fans, they caught onto what I was doing with this story very quickly. I’m looking forward to next year! The Kickstarter campaign for Tattered Weave is in its final days. We’re almost $8k and already hit our first stretch goal! Michelle C of Ava’s Demon will be designing a Kith (one of the magical pets you can befriend in the game) for us. Come join us for an interactive story after the end of the world. Guess it didn’t like the dessert as much. You are correct. Thumbs up!